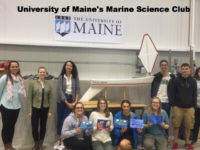 University of Maine Marine Science Club students recently gathered to test the Maine’s statewide miniboat in the University’s Wind and Wave tank (W2). 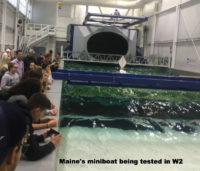 W2 is designed to test 1/8th scale models of marine industry projects, including Maine’s offshore wind turbines. The miniboat came through these tests beautifully and survived even the most extreme settings! 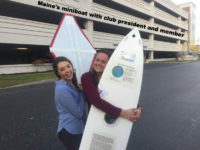 “I love this boat!” Hattie T, University of Maine student and active member of Marine Science Club, exclaims holding Maine’s miniboat with club president Emily C.
Maine’s miniboat is for students across Maine, this project is supported by Maine Coastal Program, a branch of Maine Department of Agriculture, Conservation, and Forestry. Science club students are working hard to help Maine Coastal Program engage students of all grades across Maine by helping students understand more about marine science and coastal communities. 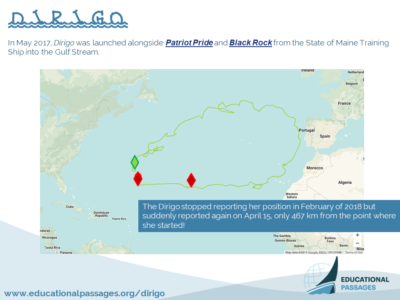 In September 2017, with Dirigo was approaching the Iberian Peninsula, we initiated emails to prepare for recovery operations, but the Dirigo skirted past and started to sail west! In May 2017, Dirigo was launched alongside Patriot Pride and Black Rock from the State of Maine Training Ship into the Gulf Stream. The Dirigo reported today, and only 467 km from the point where she started! The Dirigo stopped reporting her position in February of 2018. She was so close to making a full circle, too! 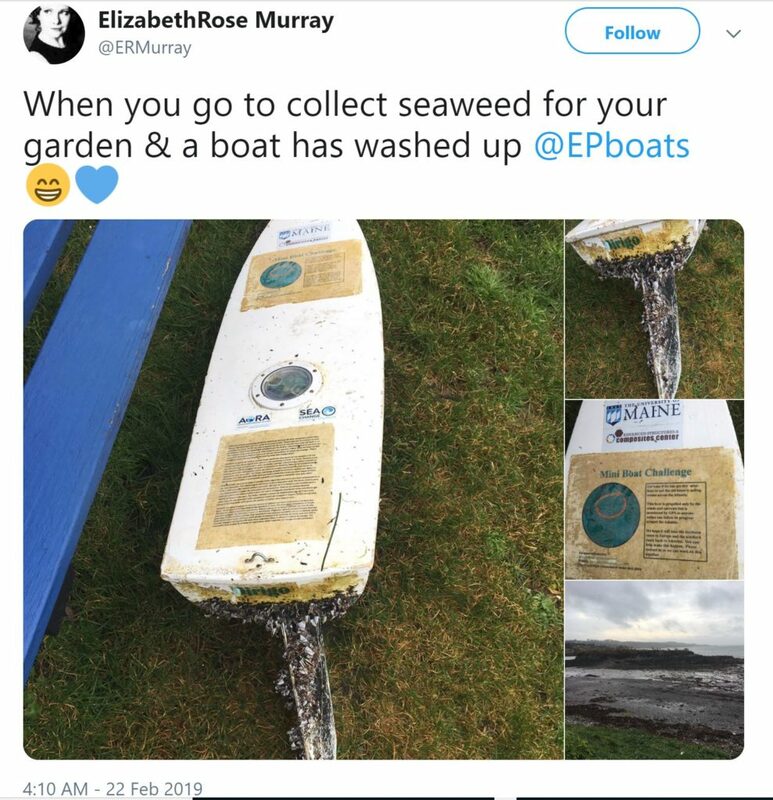 February 22, 2019 - Found in Ireland!